Here are a few other gourmet highlights from our recent London trip. 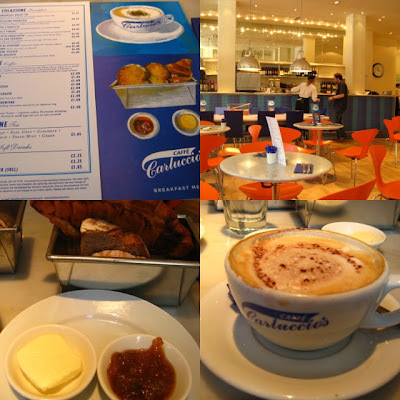 Cool cafe – Carluccio’s (lots of branches around town) serves reasonably priced simple cafe food – sandwiches, salads and a decent breakfast. They alsp have a large selection of Italian food products in the deli that can either be eaten on the premises or bought as takeaway. Best espresso and cappucino – Nothing beats that traditional Italian ambiance, complete with footballs and surly Italian waitstaff at Soho’s Bar Italia on Frith street. Coffee beans to go – Monmouth Coffee Company is a coffee roasting company with its’ original store in Covent Garden and another at the Borough Market. Spanish gourmet food items – Brindisa is the only place to go in London for authentic Spanish ingredients – from piquillo peppers to Ortiz sardines to melt-in-the-mouth Jamon jabugo. They also have a small counter-style restaurant at the Borough market specializing in all things Spanish. Traditional Department Store – Fortnum & Mason is where to go for a fantastic picninc hamper and the goodies to put inside it or the place to enjoy a traditional afternoon tea at the St. James restaurant.